'Aristocracies', 'Old Regime colonial elites' - from Adam Smith to Karl Marx and beyond, scholars have discussed their role in the rise of the modern world, in economic development and capitalism. Generally speaking and with the exception of the English landlords, the verdict has been always negative. Furthermore, historians have usually viewed the Ancien régime aristocracies and colonial elites as social groups with entirely irrational or completely apathetic attitudes towards the management of their estates. This book constitutes the first attempt to analyse the question in a more critical and historical way. It takes a directly comparative approach, covering countries from Peru to Russia and from Naples to England in the early modern period and up to the end of the 18th century. The rationale of how these elites administered their patrimonies, its political, social and sometime moral dimensions, and the real effects of all this on economic development are considered here as key aspects for a better understanding of economic life. The result is a quite different picture in which economic history is also seen as the outcome of human actions in their own social and political context. 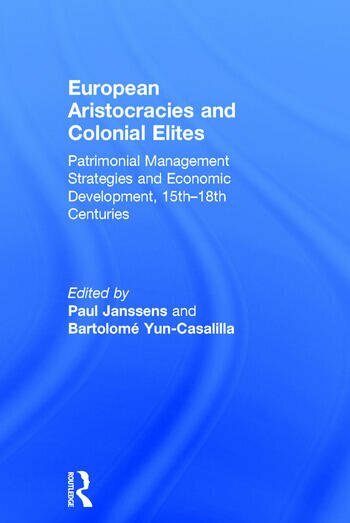 Contents: Introduction, Paul Janssens & Bartolomé Yun-Casalilla; Old regime aristocracies, colonial elites and economic development: a reconsideration, Bartolomé Yun-Casalilla. Northern Europe: Landlords and economic development in England, 1450-1800, Robert C. Allen; The characteristics of an aristocratic economy in France, 16th-18th centuries, Jean Duma; The economic role of the Belgian aristocracy in the 17th and 18th centuries, Karel Degryse and Paul Janssens. Southern Europe: From political and social management to economic management? Castilian aristocracy and economic development, 1450-1800, Bartolomé Yun-Casalilla; the aristocratic estates in Portugal and their management, 1600-1834, Nuno GonÃ§alo Monteiro; The structure of aristocratic patrimonies in the kingdom of Naples: management strategies and regional development, 16th-18th centuries, Giovanni Muto. Central and Eastern Europe: Two ages of seigniorial economy in Brandenburg-Prussia: structural innovation in the 16th century, productivity gains in the 18th century, William W. Hagen; Entrepreneurship and management on the estates of the Austrian nobility, 1550-1780, Herbert Knittler; Economic activity of the Polish nobility and its consequences: the manorial system in the early modern times, Jerzy Topolski; Early modern Russian estate management and economic development, Richard Hellie. Colonial America: The role of aristocratic management strategies in the economic development of the British North American Chesapeake, Lorena S. Walsh; Ephemeral splendor and a lengthy tradition: the Peruvian aristocracy of the late colonial period, Juan F. Marchena; Brazilian sugar planters as aristocratic managers, 1550-1825, Stuart B. Schwartz; Final considerations: Aristocracies and economic progress under the Ancien Régime, Patrick Karl O'Brien. Selected bibliography; Index. Paul Janssens is Professor at the Katholieke Universiteit, Brussels, Belgium. Bartolomé Yun-Casalilla is Professor at the European University Institute, Florence, Italy.